K 9 (1969) The gas screw K 9 was destroyed by a storm July 10, 1969 off of Cape Greig, Bristol Bay. K #12 (1942) The 37 ton 53 foot scow K #12 foundered May 27, 1942 eight miles west of Cape Saint Elias. K F C 6 (1964) The 9 ton 30 foot wooden gas screw fishing vessel K F C 6 was reported lost at Kodiak in the Good Friday earthquake of March 27, 1964. K F C 127 (1964) The 8 ton 27 foot wooden gas screw fishing vessel K F C 127 was destroyed by a tidal wave March 27, 1964 on Kodiak Island. K F C NO 1 (1946) The 125 ton barge K F C No 1 foundered May 9, 1946 at Point Gore. K-JO (1985) The 34 foot fishing vessel K-Jo sank January 14, 1985 off of Marmot Island. Two men from the vessel were rescued two days later. The third, Jon Early from Kodiak was lost. KACHEMAK LADY (1989) The fishing vessel Kachemak Lady sank April 27, 1989 off of Chugach Island. All crewmembers made it to safety. KADYAK (1860) The 500 ton ship Kadyak (Kadiak) struck a rock off of Woody Island near Kodiak and sank in Monk’s Lagoon on Spruce Island nearby, March 30, 1860. The vessel was carrying 356 tons of ice bound for San Francisco when it sank in 70 feet of water. She was owned by the Russian-American Trading Company of San Francisco. The Kadyak was found in 2003 and the site surveyed in 2004. The wreck site has been called “Alaska’s first underwater archeology project” and oldest shipwreck discovered in the state to date. The Alaska Department of Natural Resources, Division of Parks and Outdoor Recreation, Office of History and Archeology has a detailed description of the history, discovery and exploration of the Kadyak wreck site online. KAHILTNA II (1987) The 47 foot halibut fishing vessel Kahiltna II sank May 5, 1987 approximately 55 miles from Cape Resurrection. All five crewmembers were picked up from a raft by the fishing vessel Sea Scape and taken to Cordova. KALIAKH (1981) The 86 foot power scow Kaliakh drug anchor, drifted onto the rocks, rolled over and was lost December 13, 1981 in Iliasik Passage near Cold Bay. All those on board were picked up by the tug Jeffrey Foss and then transferred to the Coast Guard Cutter Ironwood. KALUGIN (1995) The 37 foot fiberglass fishing vessel Kalugin grounded and broke up in the surf February 3, 1995 in Resurrection Bay. Both crewmembers made it to safety. KAMCHATKA (1921) The 552 ton wooden motorship Kamchatka caught fire midnight Thursday April 14, 1921 approximately 400 miles off of the Shumagin Islands. The blaze started in the engine room and spread rapidly. All 23 of the crewmen escaped to a launch and a whaleboat. 86 hours after abandoning ship the group reached the Shumagin Islands and safety. The Kamchatka had departed Seattle April 3, 1921 bound for Petropovlovak, Kamchatka, Siberia. She was laden with 436 tons of general trading cargo and oil worth $200,000. The conditions at the time were listed as “strong breeze, clear, rough sea, dark.” The dismasted burned hulk was sighted May 23, 1921 drifting far to the south. 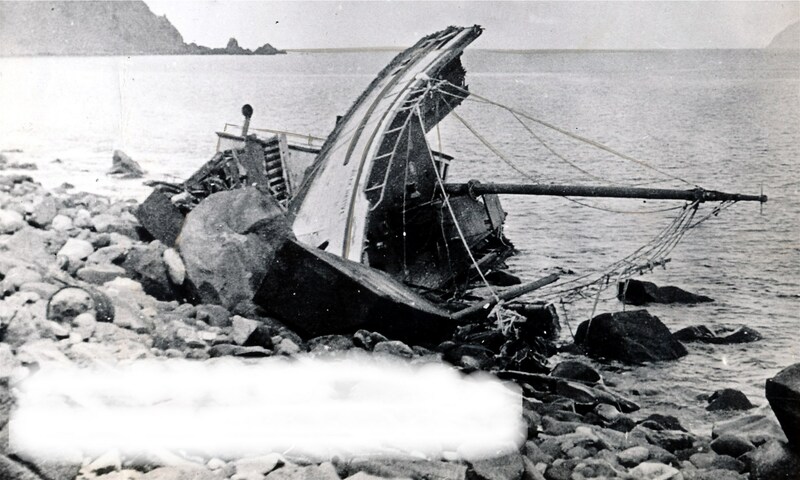 KAMISHAK (1959) The 12 ton 36 foot wooden gas screw fishing vessel Kamishak foundered July 1, 1959 at Cape Kumlik. KAMISHAK QUEEN (1996) The 76 foot steel longline fishing vessel Kamishak Queen flooded and sank July 2, 1996 in Nuka Bay. She was traveling from Homer to Seward when her engine room began to flood. Attempts were made to locate the problem and dewater the vessel. From the time the flooding was apparent and a distress call was issued until the crew abandoned ship was six minutes. The Kamishak Queen sank seven minutes later. The two persons aboard made it to safety. It was surmised that a large valve, valve seat or related piping in the engine room had failed. Suspect were the main engine after cooler through hull fittings, valves and piping. Also considered were crab tank through hull fittings, risers, valves and piping. Electrolytic corrosion where indifferent metals were in contact had been noted on the through hull valve seat for the crab tank ballasting system. The vessel was enroute to Seward to be hauled out of the water to make repairs. KANATAK (1929) The 62 foot wooden diesel powered halibut fishing vessel Kanatak disappeared in a northeasterly storm with 9 crewmen aboard. The vessel departed Seward about October 25, 1929 bound for deep sea fisheries and was last seen on November 11th. Lost in the disaster were master and part owner Conrad Wold of Seattle, Swerdrup Sverdrups, Barney Vanabo, Conrad Novik, Hans Wag, Louis Furanos and Karstein Poulson. The Kanatak was carrying 15,000 pounds of fresh halibut valued at $1,500. The vessel was last seen 30 miles northeast of Cape St Elias. KANDU (1966) The 87 ton 76 foot steel oil screw fishing vessel Kandu foundered November 25, 1966 off of Anchor Point. Lost were captain Joe Sambo of Anchorage, Lloyd Nichols of Anchorage and Marvin McGahan of Kenai. The men had abandoned ship to a skiff which capsized in the eight to ten foot seas. KARI (1994) The 28 foot salmon seiner Kari flooded and sank August 8, 1994 near Sand Point. Both crewmembers were rescued by another fishing vessel. KARLUK (1829) The Russian vessel Karluk was lost November 14, 1829 in Uganik Bay on the west side of Kodiak Island. The crew survived and salvaged the cargo and fittings from the Karluk. The loss was attributed to a navigational error and violent winds. The Karluk was travelling from Kodiak to Katmai. KARLUK (1899) The launch Karluk was driven ashore near Cape Karluk and lost in 1899. The Karluk was valued at $5,200 with cargo. KASILOF (1962) Two crewmen were lost from the 65 foot wooden oil screw fishing vessel Kasilof on July 21, 1962. Jimmy Allain and H A Sanguinetti left the Kasilof in a skiff to go hunting in Geographic Harbor. The skiff was found running against the beach and an oar and life jacket were found floating in the bay. Jimmy Allain (18) and Henry Sanguinetti (19) were never found. The Katalla Queen was listed as worth $2,500 with no cargo or insurance. She had departed Ellamar September 2nd bound for Valdez with 2 crewmen aboard. The crew survived but the Katalla Queen was a total loss. Owner R G Doherty listed the vessel as worth $2,500 no insurance no cargo and an unknown crew. KATE & ANNA (1889) The 45 foot wooden steam sealing schooner Kate & Anna parted her anchor chain in a heavy gale at 2:00 p.m. March 19, 1889 and stranded. The six crewmen made it to safety, but the Kate & Anna, valued at $7,500 and her cargo, made up of a ten ton hunting and fishing outfit worth $2,500, were lost. The tragedy took place at the SW shore of Morzhovoi Bay on the Alaska Peninsula. KATHI J (1961) The 8 ton 29 foot wooden gas screw fishing vessel Kathi J burned July 18, 1961 at Naknek. KATHLEEN ANN (1954) The 11 ton 34 foot wooden gas screw fishing vessel Kathleen Ann was consumed by fire July 15, 1954 near the entrance of Canoe Bay in Pavlof Bay. KATHY JOANNE (1983) The fishing vessel Kathy Joanne lost power, broached in a heavy surf and was blown ashore January 15, 1983 on Badger Point on the southern tip of the Kenai Peninsula. KATHY LYNN (1986) The 58 foot fishing vessel Kathy Lynn began taking on water and was abandoned August 22, 1986 in Whale Pass. The three persons aboard were picked up by the fishing vessel Fred J.
KATMAI (1971) The 82 foot wooden oil screw crab fishing vessel Katmai sank in deep water between Mitrofania Island and Coal Cape June 21, 1971 when her seams opened up. The four man crew was rescued. KATY-T (1955) The 8 ton 29 foot wooden gas screw fishing vessel Katy-T was consumed by fire July 27, 1955 at Uyak Bay on Kodiak Island. KAVKAZ (1999) The 36 foot fiberglass long line cod fishing vessel Kavkaz iced up and capsized January 30, 1999 near Dangerous Cape, a mile and a half off of Point Pogibshi. The crew, two brothers, Anton Sanarov and Feodor (Fred) Sanarov were trapped beneath the overturned vessel until a hole was cut through the hull with a chainsaw almost a day later by the crew of the Coast Guard cutter Roanoke Island. The two brothers had both donned survival suits but Feodor Sanarov’s zipper split open. Feodor was lost to hypothermia, but Anton survived. KAYAK (1980) The floating cannery Kayak ran up on the rocks, rolled over and sank in a heavy southeast storm May 29, 1980 off of the southwest end of Kayak Island near Sea Ranger Reef. The vessel was experiencing electrical problems that effected the hydraulic steering. The captain and crew of 9 and processing plant workers abandoned ship to life boats and were rescued by the fishing vessel Aloha. All 10 survivors were transferred to the fishing vessel Shirley J who transported them to Cordova. KAYLA MARIE C (2007) The 37 foot fiberglass fishing vessel Kayla Marie C struck a submerged rock near Three Sisters Rocks and foundered September 2, 2007 near Old Harbor on Kodiak Island. The one person aboard made it to safety. KELLY B (1967) The 14 ton 32 foot wooden gas screw fishing vessel Kelly B collided with a rock and was lost July 3, 1967 in Crab Bay, Prince William Sound. KELLY B (1973) The fishing vessel Kelly B exploded while refueling January 1, 1973 in Cedar Bay, Prince William Sound. KELSANDO II (1982) The pleasure craft Kelsando II sank January 1, 1982 in Port Wells. KEMAR (2000) The 32 foot wooden salmon fishing vessel Kemar caught fire from an overheated engine manifold and was lost July 17, 2000 near Etolin Point in Bristol Bay. KENAI I (1948) The 163 ton 82 foot wooden oil screw Kenai I was consumed by fire August 3, 1948 at the mouth of the Kasilof River in Cook Inlet. KEPALA (2007) The 50 foot fiberglass fishing vessel Kepala experienced an engine room fire originating on the exhaust lagging September 11, 2007 which consumed the vessel to the waterline. She drifted ashore near Black Point in Tatitlek Narrows. All three crewmembers escaped to a life raft and were picked up by Good Samaritan vessels including the 80 foot fishing vessel Sound Pacer and 51 foot fishing vessel Tri-K out of Cordova. The Kepala listed Kodiak as her home port. KERRY (1952) The 11 ton 33 foot wooden gas screw fishing vessel Kerry stranded and was lost February 15, 1952 on Afognak Island. KETA (1984) The fishing vessel Keta was destroyed by fire January 1, 1984 at Olsen Island. KETIVIK (2015) The 50 foot steel landing craft Ketivik disappeared on a trip from Ugashik to Egegik. Roland Briggs was alone on the vessel and was lost with her. KETOVIA (1962) The 53 ton 57 foot wooden oil screw fishing vessel Ketovia burned September 21, 1962 in Cook Inlet. KEVALASKA (1975) The 326 foot steel barge Kevalaksa capsized and was lost May 25, 1975 near Seldovia and Kachemak Bay. The vessel was a U S Navy Landing Craft converted to a barge and was hauling general cargo including logs and cement. The Kevalaska was being towed by the tug Daphne. The barge and cargo were valued at 1.2 million dollars. KEY WEST (1917) The vessel Key West was lost in Unimak Pass near Scotch Cap in 1917. KEY WEST (1978) The crab fishing vessel Key West flooded her lazarette in a violent storm and sank October 23, 1978 in the Bering Sea 40 miles north of Amak Island. The Key West, formerly the La Regina, had recently been brought from the east coast. She only survived three crab fishing trips. KFC-7 (1961) The 7 ton 31 foot wooden gas screw fishing vessel KFC-7 burned October 3, 1961 at Chignik Lagoon. KFC-8 (1954) The 9 ton 30 foot wooden gas screw fishing vessel KFC-8 burned November 28, 1954 near Afognak. KIEJAK (1971) The 86 foot fishing vessel Kiejak took on water, ran aground and was lost April 27, 1971 In Dry Bay. All four crewmembers were rescued by pilots from Yakutat. KIM (1992) The 32 foot salmon seiner Kim caught her net in the wheel, grounded and sank July 9, 1992 near Egegik. There was no loss of life. KIMBACK (1917) The motor vessel Kimback (see Kumback) was lost December 19, 1917 at Anchorage. KIMBERLY (2012) The 58 foot steel fishing vessel Kimberly grounded in Jute Bay at 10:06 P.M. January 24, 2012. Winds were gusting to 100 miles an hour, seas were 16 feet and temperatures were well below freezing. A U. S. Coast Guard helicopter arrived on scene but weather conditions prevented a rescue and the chopper returned to Kodiak for fuel. During a second rescue attempt the Jayhawk helicopter that had been dispatched was diverted to another vessel in distress; the Heritage with seven crewmen aboard. That helicopter was able to retrieve two of the Heritage crewmembers. The Good Samaritan vessel Tuxedni rescued the other five. A third helicopter was sent and rescued the four fishermen from the Kimberly. All eleven rescued crewmembers were wearing survival suits. Two of the crewmen from the Kimberly had to be treated for severe hypothermia. KING (1964) The 35 foot steel gas screw fishing vessel King was destroyed by the earthquake and tidal wave of March 27, 1964 at Kodiak. KING JAMES (1980) One person was presumed lost when the fishing vessel King James was found abandoned at the Seal Bar marker near Egg Island on the Copper River Delta. KISKA (1978) The 34 foot vessel Kiska was lost off of Sitkalidak Island December 14, 1978. KITSAP (1966) The 526 ton 159 foot wooden ferry Kitsap foundered November 3, 1966 about ¾ of a mile northwest of Tonki Cape Light. The Kitsap was built as a ferry for the Kitsap County Transportation Company and launched from the Lake Washington Shipyard in 1925. She held about 100 cars and 800 passengers and travelled at 12 knots. From 1925 till 1966 the ferry was operated in Washington and Oregon waters. In 1966 she was purchased to be used as a cannery in Alaska but did not survive the trip north. The Kitsap sank while under tow near Kodiak Island, ending a long and colorful career. KITTI WAKE (1988) The 32 foot gillnet fishing vessel Kitti Wake was burned July 3, 1988 in Cook Inlet. KNIGHT ISLAND (1994) The 152 foot steel salmon tender Knight Island took on water from the bow, capsized and sank August 1, 1994 approximately one mile off of Cape Ugat in 15 to 20 fathoms of water. The three crewmembers on board were rescued by a Good Samaritan fishing vessel and the U S Coast Guard Cutter Sedge. It was suspected that the flooding may have been related to a collision that the Knight Island was involved in July 6, 1994. Those aboard made it to safety but the Kodiak, worth $9,000 was a total loss. Her cargo is reported as partially salvaged. All of the crewmen escaped to safety, but the Kodiak, worth $12,000 was a total loss. KODIAK KID (1982) The 43 foot tug Kodiak Kid sank January 29, 1982 north of Woody Island near Kodiak. The two persons aboard escaped to a life raft. The EPIRB signal from the raft was picked up by a U S Coast Guard C-130 and the two were rescued by a Coast Guard helicopter soon after. KODIAK PRINCE (1986) The 26 foot vessel Kodiak Prince rolled over and sank February 12, 1986 off of the south end of Kodiak Island. KOHO (1983) The 70 foot sailboat Koho took on water, capsized and sank April 3, 1983 two miles south of Kayak Island. The three crewmen from the Koho were being assisted by three Coast Guard men in a small boat from the cutter Sweetbrier and two crewmen from the fishing vessel Arrow when a large wave caused crab pots to shift aboard the sailboat. The Koho soon rolled over and sank. All eight men were rescued. Crewmen rescued from the Koho were T K Smith and Tony Cornfejo of Seattle and Onnis Cannon of Richfield, MI. KOSHUN MARU (1930) The Japanese steamer Koshun Maru broke in two near Scotch Cap in Unimak Pass in 1930. The vessel was traveling from Puget Sound to the Orient with a cargo of lumber. KRISTEN (2001) The 49 foot longline fishing vessel Kristen struck an unknown object, flooded and sank May 11, 2001 approximately 23 miles south of Cold Bay. All four crewmembers were rescued by the fishing vessel Mr Bill and transported to King Cove. KROLIK (1993) The 28 foot fishing vessel Krolik flooded and sank September 23, 1993 in Humpy Cove, Resurrection Bay. The sole occupant of the vessel made it to safety. KUMBACK (1917) The 37 ton 50 foot gas screw yacht Kumback foundered off of Anchorage December 19, 1917. The two persons aboard made it to safety. KUPREANOFF (1961) The 10 ton wooden gas screw Kupreanoff foundered February 5, 1961 at Port Williams.